Can you teach anthropology to very young children? Children learn by observation and experience, so anthropology seems like an inevitable and spontaneous by-product of everyday life. However, adults must provide them with the right opportunity. 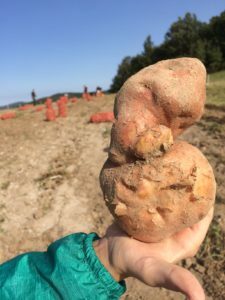 As a mother of three children, and an anthropologist, my personal and research interests led my family to engage three times in WWOOF (World Wide Opportunities on Organic Farms). 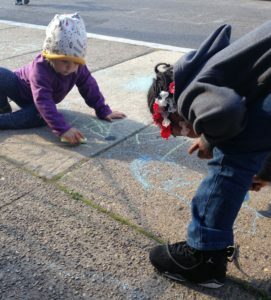 I consider these experiences to be our children’s first exposure to ethnographic fieldwork. We shared housing with our hosts, prepared meals together, and participated in work on the farm. As we became part of the daily lives of our hosts, we essentially participated in ethnographic fieldwork. For example, when we shared a room with a young Muslim woman from Indonesia, her head covering fascinated my oldest daughter. My daughter had not taken an afternoon nap for years, and then one day after lunch she announced that she was going to sleep. Not long afterward, the muslim student returned from her after-lunch prayer, and confirmed that our daughter was indeed napping in the room. However, it turned out that she had only pretended to sleep to observe how the muslim student prayed. Much later, she could still demonstrate with great precision the bodily movement of praying. Years later when my daughter brings home ideas of islamophobia, which are creeping in from all corners around Europe, I just remind her of that student at WWOOF. She can reflect on her personal relationship with her and her right to practice her religion. Shared activities and conversations create bonds that are not easily diminished by stereotypes and populist views. 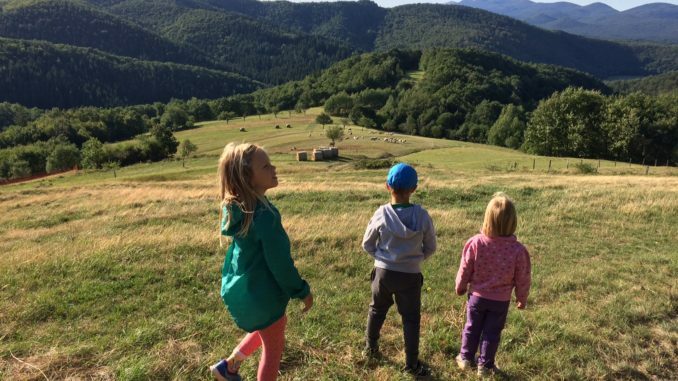 When my oldest daughter started school in Ljubljana, the capital of Slovenia, I became aware of the trend in the affluent middle-class to choose “the right school”, even though we have a good system of public schools and children are supposed to enrol in schools in their district. My oldest daughter is enrolled in one such “desirable” school simply because we lived in the neighbourhood at the time. When my second child started school, we moved to another neighbourhood with the school at the end of our street. I was told several times that this school did not have a good reputation and I was advised not to enrol my son there. This bad reputation derives from the fact that many students are from families with origins from other ex-Yugoslav countries. They are considered to be problematic, badly behaved, not able to speak Slovene well etc… Supposedly, this leads to scholastic issues for the entire school. This logic of “ethnically clean” as more “successful” or “better” goes against my anthropological thinking. For this reason (and because I believe it is important for my son to have friends from the neighbourhood so they can play in their free time), I enrolled him in the school on our street. At first glance, the social background of the children in his class is more diverse than in my daughter’s class. While chatting with my son one day, I explained to him that one particular classmate’s parents are Albanians, probably from ex-Yugoslav republic of Macedonia or Kosovo, and that at home they probably speak Albanian. I also reminded him that we were in Macedonia and Albania twice and I taught him how to greet this classmate in his native language. My son, who is generally shy did not want to enrol in any of the after school activities. However, he surprised me by signing up for football with his Albanian classmate. Kids of this age are obviously too young to teach specific anthropological theories and methodology, but we can demonstrate anthropological thinking in everyday situations. By this, I hope they will always be curious and open to the world and will not let fear towards the different and unknown guide their lives, because such fear is the greatest enemy of humankind. I also hope that they will be resilient to dogmatic thinking and comfortable with the fact that there always exist multiple truths, because that is the way life is. Talking about race in text and in person: Is hiding behind a screen helpful? Nabilah Putri Gumelar comment (tranlated to English) There is another story, a family of husband, wife and three children (still young) 3-12 years ago became a volunteer. This husband and wife are very much like me. This family, invited me to take a walk and invited me to stay home a day playing in town. Once, Barbara told me if I forgive her child, because they saw me praying quietly in the room. Well, Akumah, there’s no problem. I am glad to be able to introduce Islam. Daaan, when I was in Barbara’s message, for permission to enter her son’s experience with me in the article she made. Barbara is a PhD in anthropology. When I read, I was touched. The core of his article he tells is about teaching Anthropology to young children. Experience when participating in WWOF (at my place of internship), when the child secretly invites me to pray, and how can he practice how I pray. After a year, his son is home talking about Islam and his mother remembers me, how he reacts with me. As a result of the bonding that was built by me and his family, making this Islamamphobia does not apply to Barbara and family.